The purpose of this portal is to provide a knowledge base on Housing and Homelessness for Winnipeg and Manitoba in order to engage and educate the public, and to inform policies and programs. We hope to provide consistency in definitions and methodologies of understanding housing need in the province, and share data and research on housing and homelessness. The portal is being developed collaboratively by The Manitoba Non-Profit Housing Association with a working group of End Homelessness Winnipeg, the Institute of Urban Studies, Social Planning Council of Winnipeg, University of Manitoba - Department of City Planning, and the Winnipeg Regional Health Authority. Definitions related to housing and homelessness often differ based on the needs of an organization, and may change over time as programs and policies are developed. To some degree the discrepancies between definitions reflect nothing more than the fiscal and policy decisions of a particular government; the differences between definitions may not be as important as stating clearly which definition is being used and for what purpose. This section of the portal contains links to interactive maps to better understand the housing situation in Manitoba. If you need help with using this map, you can review User Manuals and Video Tutorials under the "Mapping + Dashboards" menu. Standard geographic area such as a neighborhood, community area, or electoral district using the Query tool. User defined area such as a 1 km buffer around a school or community center using the Proximity tool. For specific instructions on how to use the query and proximity tools to extract data from these maps, see the on-line videos we have posted (#9, 10, or 11) or go to the Case-Based tutorials page (topics #10-15). ​Alternatively, click the button below to open up a set of illustrated work examples on how to extract housing data using the query and proximity tools. Click on the image to access the interactive housing map with Core Housing Need data for Winnipeg. 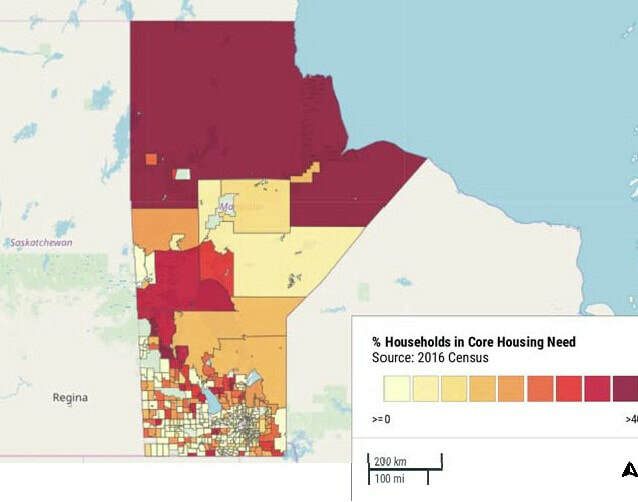 Click on the image to access the interactive housing map with Core Housing Need data for Manitoba. ​Information on the extent and nature of homelessness in Manitoba has been gathered using “point-in-time” research methodologies. Point-in-Time Counts are a measure of the number of people who are homeless on a specific day (hence the point-in-time reference). This type of counting is known as “taking a snapshot” of the situation and has been done in three Manitoba communities: Winnipeg, Brandon, and Thompson. Several on-line dashboards are being constructed so that results from the 2015 and 2018 Winnipeg Street Census can be explored interactively by end-users. The first on-line dashboard from the 2018 Winnipeg Street Census published below allows the end-user to interactively explore the inter-relationships between age, gender, Indigenous identity, and where individuals stayed the night previous to the census. Click on the image below to load the dashboard. The City of Winnipeg supports the creation of Neighbourhood Housing Plans by community stakeholders in order to build local capacity to undertake initiatives that revitalize housing in the area. The Plans also include survey data, mapping, and other information related to housing need in the community. Winnipeg Downtown Profile, 2017 – A Special Report on Demographic and Housing Market Factors in Winnipeg’s Downtown. Municipalities in Manitoba have policies and/or strategies that guide their activities on housing. Housing Market Information Portal: This Canada Mortgage and Housing Corporation Resource includes tables on New Housing Construction; Primary Rental Market; Secondary Rental Market; Seniors’ Rental Housing; Population, Households and Housing Stock; Core Housing Need. Canadian Rental Housing Index: The Index is a comprehensive database that compiles rental housing statistics for cities, regions, and provinces across Canada. See how much rent Canadians are paying in different parts of the country, compare affordability measures and find out where residents are overcrowded and severely overspending on housing. Winnipeg and Manitoba Housing Data (2014) - Housing statistics for Winnipeg and Manitoba from a number of sources including Statistics Canada, CMHC, and the Province of Manitoba. (CCPA-MB). Building a Community Asset: The Ongoing Need for Social Housing in Manitoba (2016). A review of need and demand for social housing in Manitoba. (SPCW). Observer-Rated Housing Quality Scale (OHQS): Rooming House and Single Room Occupancy Edition (2015). This is a survey tool for tenants, case managers, community-based organizations, and property owners to assess the quality of a rooming house. (IUS). Winnipeg's Vanishing Rooming Houses: Change in the West Broadway and Spence Neighbourhoods (2014) - Documents the disappearance of rooming houses from two inner-city neighbourhoods. (IUS). Rooming Houses to Rooming Homes (2014) – The history and current status of rooming houses in Winnipeg with a summary of the West Broadway Rooming House Outreach Program designed to improve the lives of rooming house tenants. (CCPA-MB). The City of Winnipeg provides data on the assessment value and taxation levels of properties across the city. The Province of Manitoba provides data on the assessment value and taxation levels of all properties outside the City of Winnipeg. "They Can Live a Life Here: Current and Past Tenants' Experiences with IRCOM's Model of Housing and Wrap-Around Supports" (2019) - Case study of Immigrant and Refugee Community Organization of Manitoba's transitional housing model. (CCPA-MB). Here We're At Home: The WestEnd Commons Model of Subsidized Housing with Supports (2018) – A three year case study of the WestEnd Commons social and affordable housing complex. (CCPA-MB). Eviction Prevention: Toolkit of Promising Practices (2016). This toolkit and resource guide is intended to be a short and accessible guide for organizations wanting to help their tenants build long-term, stable tenancies. The toolkit provides a scan of tools used by organizations undertaking eviction prevention work — also known as housing retention or housing stabilization. (IUS). Summary Evaluation of The Madison Congregate Housing (2016) - Evaluated The Madison, an 85 unit congregate housing apartment located in Winnipeg Manitoba, using qualitative methods and a cost-comparison to the findings of the At Home/Chez Soi Housing First Study. (CCPA-MB). Mixed-Income Housing Developments: Separating Myth from Reality (2015). This student paper provides an overview of the concept of mixed-income housing in Canada and uses the example of Winnipeg's Lord Selkirk Park revitalization as an example of successful redevelopment. (IUS). Holding On: Supporting Successful Tenancies for the Hard to House (2014). A review of housing retention practices across Canada with a model framework. (IUS). This page provides links to Manitoba-based research and data on homelessness. For a wealth of information and research on homelessness across Canada, visit the Homeless Hub, which contains a library of over 30,000 resources. Winnipeg Profile (2017) Population facts and statistics on Winnipeg. Thompson Profile (2017) Population facts and statistics on Thompson. Brandon Profile (2017) Population facts and statistics on Brandon. Aboriginal Homelessness in Flin Flon Manitoba (2016) - This study attempts to contribute to our knowledge about urban Aboriginal homelessness with research on this issues in Flin Flon, Manitoba, a small northern mining community. (CCPA-MB). Moving to the City: Housing and Aboriginal Migration to Winnipeg (2014) A report documenting the challenges and experiences of Aboriginal people have finding housing in Winnipeg, and providing recommended solutions to ease the search. (CCPA-MB). System Pathways into Youth Homelessness (2014). Explores the systemic factors contributing to youth living on the street or in various types of insecure shelter for prolonged periods of time. (SPCW). The Plan to End Homelessness in Winnipeg (2014) - 30 women with experience in homelessness and 13 key informants were interviewed, and their responses were analyzed and presented in this paper. Here and Now: Winnipeg Plan to End Youth Homelessness (2016) - This plan intends to serve as a guide for government, funders and community members committed to ending youth homelessness. Brandon Plan to End Youth Homelessness: A Place to Call Home: Brandon’s Roadmap - An ambitious and bold set of recommendations to implement strategies to end youth homelessness. The Winnipeg Street Health Report (2011) - The results of a survey on the health status of homeless people in Winnipeg. The findings focus on the physical and mental health status of homeless people, how they use health care and social services, and their experiences of accessing these systems. 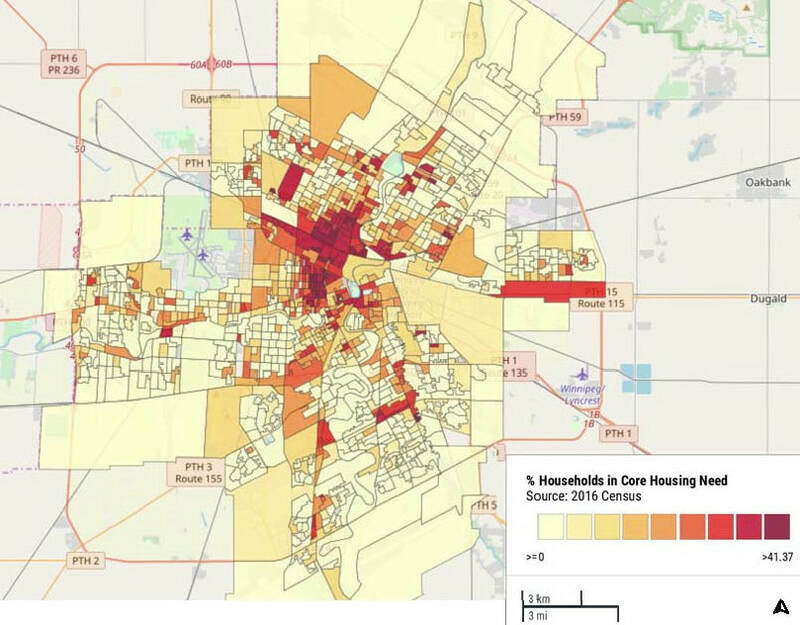 Where possible, this report compares the health of those surveyed with available information for the general population of the City of Winnipeg. (Main Street Project). At Home in Winnipeg: Localizing Housing First as a Culturally Responsive Approach to Understanding and Addressing Urban Indigenous Homelessness (2018). This report focuses on Winnipeg’s model and governance structure of Housing First implementation. (IUS). The At Home/Chez Soi Fact Sheets comprises a series of brief reports highlighting key features and themes of the At Home/Chez Soi Housing First demonstration project in Winnipeg. Winnipeg Final Report: At Home/Chez Soi Project (2014) - Presents the results of the four-year study. At Home/Chez Soi Project Sustainability (2016) - The last Winnipeg Site Report covers the final period of the project when Sustainability of the project was being planned and implemented, and tells the sustainability story of the project. Additional information on the At Home/Chez Soi project. In this section of the portal we will be publishing a number of interactive dashboards to support the exploration of housing trends in Winnipeg and across Manitoba using data from the 2016 Census. View additional statistics: To view different housing statistics, click on the tabs at the top of the dashboard. Click on the Download Image icon at the bottom of the screen. You can export the dashboard as a .png image file, an Adobe Acrobat pdf file, or as a Powerpoint (.ppt) file.